This is a single directional compactor. This means simply that the machine will only move in one direction while in operation. Many larger compactors offer a reverse function that, when activated, will change the direction of travel from forwards to backwards. We do not offer this style for rent. This unit has an optional water tank that will dispense water onto the ground during compaction. The unit is powered by a 5.5hp Honda engine that runs on regular gas and has an operating weight of 217 lbs. The plate size is 19.7x20.7 in. It operates at 5,800 vibrations/minute with a force of 3,450 pounds. It travels at a rate of 56 ft./min. 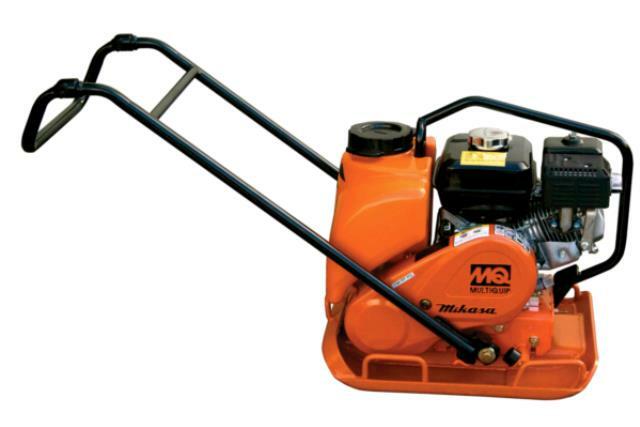 This tool is used for the compaction of soils, in preparation of laying pavers or pouring concrete. Also, it is used for hot/cold patch repair of asphalt. Lastly, it can be used after laying pavers to set them in place, however, depending upon the type of pavers, breakage may occur and it should be performed cautiously. Pick up truck or trailer is recommended for transport. Needs 2 people to load and unload as it is heavy and awkward. * Please call us for any questions on our plate compactor in Concord, serving all of New Hampshire, including Manchester, Canterbury, Loudon, Hillsboro, and Northwood.